In 1903 a colony of "homeseekers," headed by a group of Methodist ministers in Kentucky, formed a corporation called the "Kentucky, Oklahoma, Indian Territory and Adjacent States Land and Townsite Co." and sold stock in the company throughout the state of Kentucky. The purpose of the group was to locate and promote a townsite in Oklahoma Territory where Methodist ministers could purchase lots or acreage surrounding the town and retire. However, the corporation attracted other investors who were not connected solely with the Methodist church, and the mission of the group changed to a central theme of promoting a new town in Oklahoma Territory. 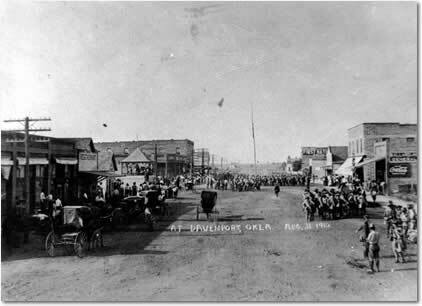 Davenport was incorporated as a town in 1906 and was named after the postmaster, Nettie Davenport. for the local citizens and erected a flag pole in the middle of Broadway. The main street of Davenport is paved with bricks manufactured at the Davenport Brick Plant, which ceased operation in 1930. Local historical locations include the Kenton Gold Mine Cave, located on private property on the Sporleder farm north of town, where reportedly the mineral found was assayed at $18.00 per thousand, much less than the amount needed to continue mining; Davenport Cemetery on Highway 66, which contains one of the best examples of the work of the Works Progress Administration (WPA)--a beautiful native stone stone chapel; Gobbler's Knob--the high hill a mile northwest of town, which is the highest point in Lincoln County (It derives its name from early pioneer days in the 1890's when there was a large population of wild turkeys in the area.) The Jessamine Hotel on Broadway in downtown Davenport is constructed of concrete blocks that were made by the Davenport Concrete Block Factory in 1906-07 to simulate rough cut stone. The Tipton home on the east edge of town was built in the late 1920's and is symbolic of the oil boom days. Today, the largest local employer in Davenport is Central Oklahoma Telephone Co., an independent telecommunications firm that is headquartered in Davenport and serves seven other towns in the area with phone service and Internet services. Many local residents commute daily to jobs in Oklahoma City and Tulsa. A large portion of the local work force is employed in neighboring Chandler at the National American Insurance Company and the Hiland Dairy. Davenport is a Capital Improvement Planning city. 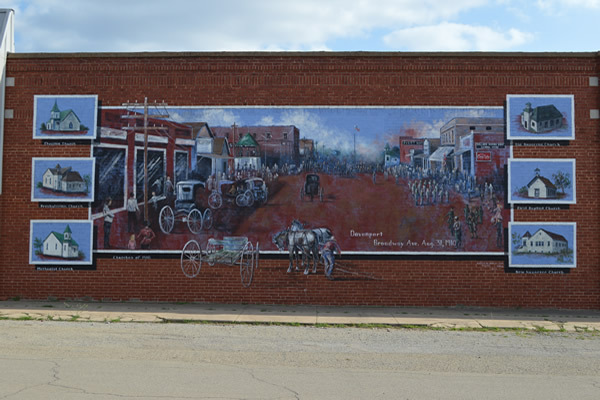 Davenport's newest historic scene mural was completed in September 2013. Thanks to the local chamber of commerce and the Davenport community which raises money for projects each year. The finished scene -- Broadway Avenue in Davenport Aug. 31, 1910 -- is shown here on the north side of the Nazarene Clothes Closet Building at 2nd and Broadway. This building is known to old timers as the old Glenn Nichols Store Building. 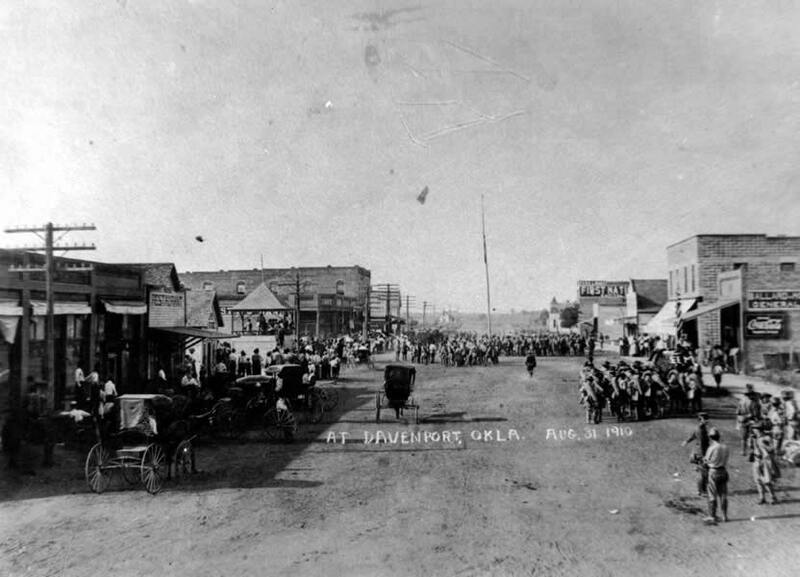 The busy street scene, reproduced from an actual photo, shows the National Guard Unit that had marched overland from Chandler early that morning. They had about a 4-5 hour layover waiting for the northbound Santa Fe train that would take them to summer camp at Fort Riley, Kan. The soldiers and townsfolk had a great time that day. A flag pole was erected in the middle of the street; the soldiers marched and performed for the locals, and even put on a target shooting demonstration on vacant lots behind Dr. Nickell's office. Surrounding the street scene are the churches that were in existence in town in 1910 -- First Christian, First Presbyterian, First Methodist, Church of the Nazarene and First Baptist. The church scenes were reproduced from actual photos of the time. Plans are to feature the other four churches in town in the next mural scene project, along with other scenes. Noted mural artist Dr. Robert Palmer and his University of Central Oklahoma students have painted the murals in the community.